In history, the area of present-day Somalia was the site of several powerful empires, and an important commercial centre, including trading in spices with merchants from India. Islam arrived before the 9th century, and Islamic sultanates dominated the region into European colonial times, making treaties with European forces from the 17th century onwards. In the late 19th century Britain and Italy gained control of British Somaliland in the south and Italian Somaliland in the north, respectively. Ethiopia and France also laid claims to part of present-day Somalia. Italian Somaliland was taken by Britain in 1941, later becoming a UN trusteeship under Italian administration. In 1960 the two regions united to become the independent Somali Republic. Initially under a civilian government, a coup in 1969 was followed by military or one-party rule through the 1970s and 80s. Military conflict with Ethiopia in the 1970s was a foreshadowing of the Somali civil war that began in 1991, during which time Somalia was viewed as a ‘failed state’. With no central governmental authority for several years, many areas returned to customary or religious law. Parts of the south were held by various Islamic groups; Somaliland in the north declared itself an independent state; and Puntland in the northeast declared itself an autonomous region within Somalia. Transitional institutions were established from 2000 in parts of the country, but much of the south remained under the control of various groups, including Al-Shabaab. Various attempts at peace talks, coalition government and other transitional governance, at the same time as military operations, continued throughout the 2000s, until a transitional federal government was formed in 2012. However, there is significant ongoing instability. Somaliland is a self-declared sovereign state currently recognised by the internationally community as an autonomous territory, and Puntland also considers itself an autonomous state. These two regions remain slightly more stable than the still-contested southern zones, including the capital, Mogadishu. Although Somalia remains poor, with a low GDP per capita, the war did not have as drastic effect on the economy as may have been expected. In part this is because the maintenance of traditional governance in some regions made private sector activity possible, often funded by remittances from the extensive Somali diaspora. Such activities include communications, money transfer and transport industries. Agriculture, mainly livestock, dominates the economy: most of the population are nomadic or semi-nomadic pastoralists. As well as livestock – often to Gulf states – other key exports include fish, charcoal and bananas. Recent developments have included fish and meat processing and other manufacturing plants. A semi-arid to arid country, Somalia has very restricted water resources. There are only two permanent rivers, both in the south. Elsewhere, all rivers are ephemeral, flowing only for hours or days. Groundwater is the sole water resource for most of the country, in rural and urban areas. However, because of low rainfall and widely deep groundwater tables, accessing groundwater is difficult, and expensive, in much of the country. Please cite this page as: Gadain, Stevanovic, Upton, Ó Dochartaigh and Bellwood-Howard, 2018. Somalia. Map developed from USGS GTOPOPO30; GADM global administrative areas; and UN Revision of World Urbanization Prospects. For more information on the map development and datasets see the geography resource page. Much of the north and centre of Somalia have an arid climate; and much of the rest of the north and south of the country are semi arid. Only small areas in the south have a humid climate. Annual rainfall in the north and northeast is less than 100 mm, rising to 200 mm to 300 mm in the central plateaus, and between 500 mm and 600 mm in the northwest and southwest. The little seasonal variation in climate is largely related to changes in wind patterns. There is a main monsoonal wet season in April and May, and a smaller wet season in October and November. 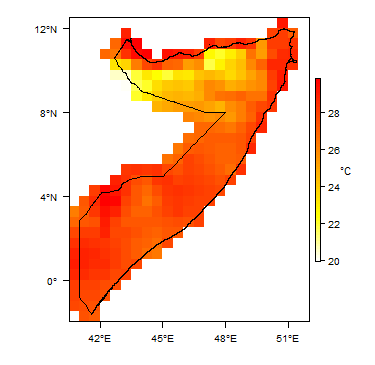 More information on average rainfall and temperature for each of the climate zones in Somalia can be seen at the Somalia climate page. These maps and graphs were developed from the CRU TS 3.21 dataset produced by the Climatic Research Unit at the University of East Anglia, UK. For more information see the climate resource page. Somalia has only two permanent rivers, the Juba and the Shabelle, both of which begin in the Ethiopian Highlands and flow southwards. In the north of the country, the arid and semi-arid climate means that all rivers are ephemeral and flashy, with water flowing for only a few hours to days after rainfall events, and there are no river gauging stations in these rivers. Before the civil war in 1991, the Ministry of Agriculture was mandated to operate river flow and climate gauging stations. Daily river level readings date back to 1951 for the two furthest upstream stations on the two rivers at the border with Ethiopia, although these records include many gaps. Data were not collected at other stations until 1963, when a network of gauging stations was established and data was collected until 1991 with few discharge measurements for rating curve establishment. During the subsequent civil war, the hydrometric network fell into complete disrepair, with no monitoring and collection of water level data until early 2000s. In 2001, FAO established the Somali Water and Land Information Management under the FAO/SWALIM project. SWALIM, with financial support from the European Union, has re-established and currently operates the river flow and climate gauging networks on the Juba and Shabelle rivers. Out of the 14 river gauging stations that were operational before the war, only eight stations are currently operational: four on the Shabelle and four on the Juba. Since the formation of the UN-backed Federal Government of Somalia (FGS) in 2012, the Ministry of Water and Energy has been the national body mandated for managing the river flow network. However, under the current political context with federal governments and regions, the Puntland State Agency for Water, Energy and Natural Resources (PSAWEN) is responsible for water management in Puntland, and the Ministry of Water Resources (MoWR) is responsible for water management in Somaliland. Owing to the complex humanitarian and emergency situation in the country, financial challenges and lack of necessary skill, these ministries remain poorly capacitated. SWALIM is currently building the capacities within these ministries for takeover of the river gauging networks. Major surface water features of Somalia. Map developed from World Wildlife Fund HydroSHEDS; Digital Chart of the World drainage; and FAO Inland Water Bodies. For more information on the map development and datasets see the surface water resource page. Most of the soils in Somalia have low nutrient and moisture availability, including calcisols, gypsisols, arenosols and solonchak and solonetz type soils that cover much of the country. 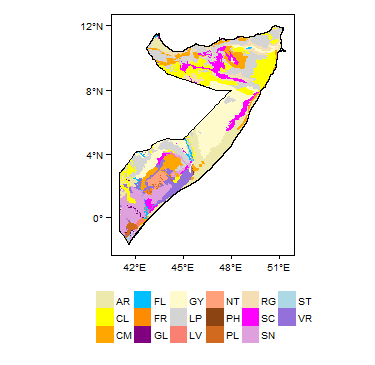 Soil Map of Somalia, from the European Commission Joint Research Centre: European Soil Portal. For more information on the map see the soil resource page. The far north of Somalia is desert or semi-desert, with semi-arid land showing sparse vegetation through much of the north and centre, and grassland and sparse forest throughout much of the south. 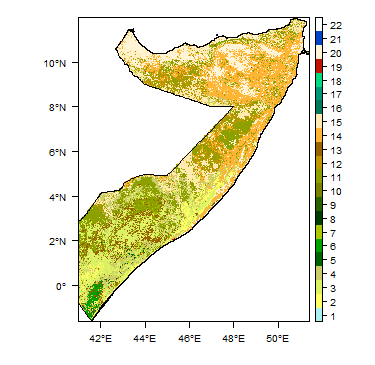 Land Cover Map of Somalia, from the European Space Agency GlobCover 2.3, 2009. For more information on the map see the land cover resource page. These statistics are sourced from FAO Aquastat. They are the most recent available information in the Aquastat database. More information on the derivation and interpretation of these statistics can be seen on the FAO Aquastat website. Further water and related statistics can be accessed at the Aquastat Main Database. This section provides a summary of the geology of Somalia. More detail can be found in the references listed at the bottom of this page. Many of these references can be accessed through the Africa Groundwater Literature Archive. The geology map on this page shows a simplified overview of the geology at a national scale (see the Geology resources page for more details). A more detailed geological map at 1:1,500,000 has also been published (see Geology: key references, below). Geology of Somalia at 1:5 million scale. Based on map described by Persits et al. 2002/Furon and Lombard 1964. For more information on the map development and datasets see the geology resource page. Alluvium Pleistocene to Holocene/Recent Older Pleistocene alluvial terrace sediments and Holocene/Recent alluvium, including sandy clay with lenses of sand and fine gravel to coarse gravels and boulders. In some areas fine sands, forming dunes, occur; as do red soils; and calcretes. Volcanic basaltic rocks Pliocene - Pleistocene These basaltic lavas were deposited in different periods. They followed existing topographical depressions and uneven basin floors. Several lava flows have tuff intercalations in some places. Iskushuban Formation; Mudug Formation; Daban Formation; Hafun Series Tertiary (Oligocene to Miocene) Thick, extensive, complex series of sedimentary rocks, including soft limestones, conglomerates and sandstones, of various origins including marine, lagoonal and continental. The Miocene Iskushuban Formation comprises marl, sandstone, gypsum, coal, limestone and fine grained conglomerate. The Oligocene/Eocene Daban Formation comprises siltstones, sandstones, conglomerates, gypsum and limestones. In total, 500 to over 2000 m thick. Individual formations are from 40 to 500 m thick. Auradu Formation; Taleex Formation; Karkar Formation Tertiary (Palaeocene-Eocene) Limestone and evaporitic rocks. The uppermost Karkar Formation crops out in the north and includes limestones, marls and dolomites, with some gypsum. The Taleex Formation covers a large area in the centre of the country and in the north, and consists largely of gypsum and anhydrite, with limestones and dolomites. The Auradu Formation, in the centre of Somalia, is fractured karstic limestone with marl and dolomitic strata (United Nations 1989). The total thickness of all units is from 700 to 1200 m. Average thicknesses of the formations are: Karkar - 200 to 300 m; Taalex - 250 m; and Auradu - 200-400 m.
Yessoma, Fer Fer and Belet Uen formations Upper Cretaceous The Yessoma Formation consists of Nubian-type sandstones with thin limestones. The Belet Uen and Fer formations consist of gypsum, marls and dolomites. The Yessoma Formation is from 100 to over 1000 m thick. The Fer Fer and Belet Uen formations are approximately 50 to 350 m thick. Cretaceous undifferentiated (mostly Lower to Middle Cretaceous) Sandstones, conglomerates, limestones and evaporitic rocks, including gypsum. These rocks occur in parts of southern Somalia, where they are dominated by calcareous and evaporitic rocks; and as scattered small outcrops in the north near the coast, where they are typically sandstones with conglomerates in the west, and limestones in the east. Probably between approximately 100 to 900 m thick. 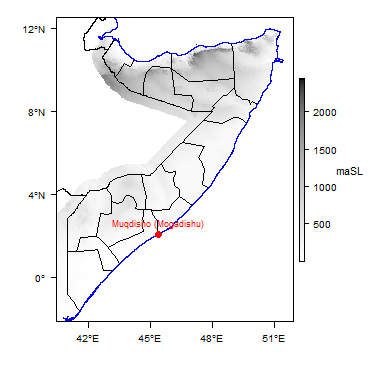 This section provides a summary of the hydrogeology of the main aquifers in Somalia. More information is available in the references listed at the bottom of this page. Many of these references can be accessed through the Africa Groundwater Literature Archive. The hydrogeology map on this page shows a simplified overview of the type and productivity of the main aquifers at a national scale (see the Hydrogeology map resource page for more details). Groundwater is of huge importance in Somalia. Apart from the areas along the Juba and Shabelle Rivers, all regions depend on groundwater for domestic water supply, livestock and small scale irrigation. There is very low effective rainfall and no perennial surface water across most of the country. Groundwater is accessed through boreholes, shallow wells and springs. Most boreholes are between 90 m and 250 m deep, but in some areas reach over 400 m deep. Most shallow wells are less than 20m deep. Yields vary from one aquifer to another, but most shallow wells yield between 2.5 and 10 m³/hr, compared to the typical range of borehole yields of between 5 to 20 m³/hr (FAO/SWALIM 2012). Groundwater quality is a major issue. Most groundwater sources have salinity levels above 2,000 µS/cm. Many of the shallow wells are also unprotected and vulnerable to microbiological and other contamination (FAO/SWALIM 2012). A number of studies have laid down a good base for further hydrogeological works (see Hydrogeology: key references, below and other references in the Africa Groundwater Literature Archive). Numerous NGOs have also worked in the region and supported urban centres and local rural and semi-urban communities by drilling water wells or conducting geophysical surveys. However, although many water projects have been implemented or supported in the region, water well drilling has commonly been conducted without adequate project feasibility studies, and to date, no systematic data collection has been carried on groundwater exploitation, capacity, and especially on groundwater level fluctuations. However, during the last few years,the FAO/SWALIM project (Somalia Water and Land Information Management) has done extensive work relating to water resources, including preparing more accurate and adequate hydrogeological maps of the northern part of Somalia, which are essential for planning any groundwater exploration and exploitation (FAO/SWALIM 2012). Alluvial terrace deposits - Pleistocene to Holocene/Recent Terrace deposits in major wadis (ephemeral river beds - called toggas). Younger Holocene/Recent deposits often overlie and are in hydraulic continuity with older Pleistocene deposits, which can result in very thick aquifers of over 100 m.
Typically high productivity aquifers, with medium to high permeability and high infiltration capacity. Estimated transmissivity values are commonly in the range 10-2 to 10-3 m²/sec. In the Geed Deeble area (source for the Hargeysa water supply), only one in ten tested boreholes showed a transmissivity of less than 10-3 m²/sec; the others ranged from 2.86 to 5.18 x 10-3 m²/sec. Calculated equivalent hydraulic conductivities were in the range 1.4 x 10-4 m/sec to 7.7 x 10-5 m/sec. Test yields of the production boreholes ranged from 12 to 20 l/s, with drawdowns typically less than 20 m (data provided by Hargeysa Water Utility). Generally unconfined, but where covered or associated with Quaternary volcanic basalts, they can be confined, sometimes with considerable artesian pressure (e.g. in the Xunboweyle area). In unconfined aquifers the water table is typically 2 to 3 m deep throughout the year, related to seasonal flows along riverbeds. In deeper confined, artesian aquifers in older deposits, the piezometric head does not fluctuate much throughout the year. Thickness varies from a few metres to over 100 m. At Geed Deeble (source for the Hargeysa water supply), the tapped aquifer depth is over 150 m. Boreholes are typically between 10 m and 50 m deep. In Somaliland in the north of Somalia, dynamic (sustainable) groundwater reserves in the major alluvial aquifers are estimated at an average flow of ~30 m³/sec. Key references for this aquifer are Faillace and Faillace 1986, FAO/SWALIM 2012, Water Supply Survey Team of the PRC 1983, Petrucci, 2008 and German Agro-Action, 2005. Pleistocene basaltic lava flows These are a potential aquifer in some areas. They contain groundwater only where fractured and/or weathered, or in lenses of pyroclastic material between lava flows. They typically have low to moderate permeability, but are locally highly fractured, increasing permeability. However, they occur primarily as elevated plateaus, and are often unsaturated. In some areas, such as Agabar and Las Dhure, they are found in the lowlands and may be saturated, and in this case are likely to be unconfined. Boreholes drilled in these areas have intersected water-bearing zones composed of sand/pyroclastic lenses and weathered basalt. In some areas, vertical fractures resulting from cooling of the basalts may occur, and are likely to form primary recharge routes. Key references for this aquifer are Faillace and Faillace 1986, FAO/SWALIM 2012 and German Agro-Action 2005. Upper Cretaceous Yessoma Formation (Nubian sandstone) The Yessoma Formation is of Nubian sandstone type and can form a high productivity aquifer. The coarsest grained part of the formation occurs between 140 m and 180 m depth. Calculated aquifer transmissivity is around 2 x 10-3 m²/sec (220 m²/day), with an average specific capacity of 7.5 m³/hour/m. Most boreholes penetrating the formation can sustain a yield of more than 30 m³/hour. Groundwater of good quality is generally supplied by dug wells in the weathered part of the aquifer. Recharge is estimated to be approximately in the range of 3 to 5% of annual rainfall (Van der Plac 2001). Jurassic sandstones Jurassic sedimentary rocks in the south of Somalia are likely to be dominated by sandstone. Their groundwater potential is not well known. Groundwater storage and flow may be by both intergranular and fracture flow. Low to moderate yields may be possible. Tertiary: Iskushuban Formation (Miocene); Mudug Formation (Oligocene/Miocene); Daban Formation (Oligocene) These form moderate productivity aquifers. Fractures act as pathways for rapid groundwater flow, but permeability and groundwater storage are small. A borehole drilled into the Miocene Iskushuban Formation in Timirishe in the Bari area yielded 5 l/s for a drawdown of some 50 m, with a calculated transmissivity of 4.5 x 10-4 m²/sec. Boreholes in the Oligocene/Miocene Mudug Formation are drilled to 180 to 220 m deep, and provide yields of 3 to 5 l/s for drawdowns in the range 3 to 24 m. Transmissivity values of 3.1 x 10-3 to 2.9 x 10-4 m²/sec were calculated. Recharge is estimated to be approximately in the range of 3 to 5% of annual rainfall (Van der Plac 2001). Cretaceous undifferentiated: sandstones, conglomerates, limestones and evaporitic rocks Little is known about the aquifer properties of these rocks. Key references for these aquifer are: Faillace and Faillace 1986, FAO/SWALIM 2012, Petrucci 2008, German Agro-Action 2005, GKW 1977 and Van der Plac 2001. Eocene Karkar, Taalex and Auradu limestones The Eocene limestone (Karkar and Auradu) and limestone/evaporite (Taalex) formations are often karstic, and are among the most significant aquifers in the north of Somalia, in the Somaliland and Puntland regions. The Karkar limestone represents the most promising fresh groundwater resource for further development in the Sool and Hawd plateaus in the north of Somalia. It typically forms a moderately productive aquifer. The Auradu limestones can form a high productivity aquifer, with good quality groundwater, although more investigation is needed. If groundwater is present, the overlying Taalex aquifer should be sealed off to prevent inflow of lower quality water. Many boreholes abstract from the aquifer, particularly in the Puntland region, with an average transmissivity of 10-3m²/sec (860 m²/day). Other boreholes over 200 m deep are drilled in limestones in the Garoowe area. Where these limestones are overlain by the Karkar formation, they are often semi-confined, with low sub-artesian pressure. The depth to water table in unconfined parts of these aquifers is usually between 5 and 15 m throughout the year. Fresh groundwater reserves in the Auradu aquifer in the Somaliland and Puntland regions are estimated as equivalent to an average flow of 63.4 m³/sec. The estimated fresh groundwater reserve in the Karkar aquifer is lower at approximately 10 m³/sec. Groundwater in the Karkar karst aquifer is slightly mineralised, with an SEC (conductivity) value typically between 1500 and 1800 micromhos/cm. The Taalex aquifer usually yields moderately to highly mineralised groundwater, derived from geogenic evaporitic minerals. Ca or CaSO4 type groundwater is dominant, with TDS usually greater than 3800 mg/l. SEC (conductivity) levels are generally very high, from 890 to 7270 microS/cm. Sulphate concentrations are in the range 125 mg/l up to 3100 mg/l, with an average of 1300 mg/l. Many boreholes have been abandoned because of a high salinity content. Groundwater from the Auradu limestones is typically of sulphate-bicarbonate type with moderate to high mineralisation, and an SEC (conductivity) value generally lower than 1000 micromhos/cm. Sulphate is the dominant element in almost all samples with a range from 3 to 220 mg/l. Jurassic limestones The Jurassic limestones in the north of the country have the greatest potential for groundwater development in the country. There is usually pure limestone in the upper part of the formation, with marly levels and calcareous sandstones in the lower part. The upper parts in particular are usually characterised by a high degree of fracturing and probably karstic cavities, and groundwater circulation probably develops mainly in this zone. The limestones can be highly permeable, with a transmissivity value from one test borehole at Borama of 3.1 x 10-3 m²/sec (270 m²/day). The depth to water table in unconfined parts of the aquifer is usually between 5 and 15 m throughout the year. Groundwater reserves in the Jurassic limestone aquifer in the Awadal region are estimated as equivalent to an average flow fo 18.9 m³/sec. Groundwater in the Jurassic aquifer is generally of bicarbonate type with low levels of mineralisation, with SEC (conductivity) commonly in the range 600 microS/cm to 1200 microS/cm. Approximate estimates of recharge are between 35% of annual rainfall for the Karkar aquifer to 50% of rainfall for the Jurassic limestone aquifer. Forms a low productivity aquifer or an aquitard, depending on the development of permeability by weathering/fracturing. Groundwater has low to moderate mineralisation, with conductivity often between 300 mS/cm and 1400 mS/cm, up to a maximum of 3570 mS/cm in some shallow wells. More than 70% of analysed waters have good characteristics according to WHO standards for drinking water in arid regions. The recent FAO/SWALIM study (2012) considered that in the northern provinces of Somaliland and Puntland, where there is no perennial surface water, "total annually rechargeable groundwater (although not necessarily available for abstraction) in the major aquifer systems is theoretically equal to some 4.3 x 109 m³. Although this amount of water, equivalent to a flow of 139 m³/s looks very promising, the large area of these two regions - more than than 289 000 km² - means that groundwater water is still scarce. Estimated specific groundwater yield is less than 0.5 l/s/km², which classifies northern Somalia as having extremely poor groundwater reserves. Most drilled boreholes provide yields in the range 1 to 5 l/s, but there are many with lower or higher yields. In some cases, boreholes can't sustain high pumping rates, but in others, the aquifer could yield more groundwater if higher capacity pumps or pipe diameters were installed to increase borehole capacity. The highest known aquifer potential is illustrated by the most productive well known in northern Somalia, in the Auradu karstic limestone aquifer in Ceerigabo, which is 159 m deep, and had a test yield of 50 l/s for a drawdown of only 2.43 m (Faillace and Faillace 1986). Another known high productivity aquifer is the terrace and alluvial sediments of Geed Deeble, which are used for the water supply of Hargeysa (the capital of Somaliland). Average boreholes yields are 15 l/s with drawdown not larger than 5-10 m.
Groundwater quality is a major issue in many parts of Somalia. The natural quality of groundwater depends in part on aquifer lithology and the soluble products of weathering; but also on aspects such as seasonal recharge, so that groundwater quality can vary from season to season. Many boreholes are abandoned because of poor water quality. The quality of groundwater in individual aquifers is summarised in the relevant tables above. A FAO/SWALIM survey in 2012 showed that in the northern Somaliland and Puntland regions, across all aquifers, only 30% of groundwater samples were below the safe SEC (conductivity) limit of 1500 microS/cm, with 29 % of the samples in the range 1500 to 3000 microS/cm and 41 % of the samples above 3000 microS/cm. Recharge occurs only if the rainfall regime is favourable. In areas with scarce and uneven rainfall, infiltration may occur only along stream beds and floodable depressions. Short duration thunderstorms covering small areas usually occur in the northern regions and generate spate flows in toggas (wadis or seasonally dry streambeds), which lasti from a couple of hours to a couple of days (Faillace and Faillace 1986). There are numerous springs in the north of Somalia in the study area of the FAO/SWALIM programme. A total of 287 springs were registered, which tend to be more common in fractured and/or karstic aquifers. They are of crucial for local ecosystems. Given the lack of perennial streams and the arid climate in much of Somalia, groundwater is the sole water resource in most of the country, except in the valleys of the two perennial rivers Juba and Shabelle. Approximately 95% of the population use groundwater for drinking water. Most groundwater is used for drinking, and for major cities. In rural areas livestock watering is also a significant groundwater use. Irrigation is not widely developed, except along the two major perennial rivers. There are no large groundwater industrial uses in the undeveloped industrial sector. The most productive groundwater sources are boreholes drilling into unconsolidated alluvial terrace aquifers and karstic aquifers. Borehole depth varies considerably, from less than 10 m in alluvium in toggas (wadis), to a few hundred meters in Eocene karstic aquifers or the Nubian (Yessoma) sandstone aquifer. Submersible pumps are necessary for deeper boreholes, while hand pumps are used to tap water from shallow aquifers. Due to limited reserves related to very low effective rainfall; a very deep groundwater table in many areas; and/or increased water salinity, there is a shortage of groundwater and very limited access to it in most of the country. The water supply situation in many parts of Somalia is therefore exceptionally severe. A large proportion of Somali people still do not have access to safe, sufficient groundwater. Several deep drilling projects have been undertaken with the aim of developing groundwater resources further, but due to lack of prior hydrogeological knowledge, the success rate of groundwater development has been very low. Fourteen water utilities serve major towns and settlements in the Somaliland and Puntland regions, with a total around 2,544,000 inhabitants - almost half of the total population of Somalia. However, not more than 25% of this population is connected to water distribution systems and pipelines (FAO/SWALIM 2012). The lowest percentage of coverage by piped water is in Sheikh, at 4%, but most problematic is Hargeysa where over 750,000 of residents, mostly in suburban areas, have no proper access to piped water. After the end of the former government of Somalia there was no legal framework for groundwater management in the country. However, in the last decade the water authorities in Somaliland and Puntland have made significant steps towards re-establishment of the water regulatory framework. In Somaliland a Water Act developed in 2004 was enacted into law in 2013, and put into use, with the Ministry of Water Resources issuing permits for groundwater drilling. The capacity of the water authorities in these two regions, however, still needs to be strengthened for the laws and policies to be fully implemented. FAO/SWALIM established an initial groundwater monitoring network in the northern provinces Somaliland and Puntland in 2012, installed with automatic water level data loggers. Currently 8 groundwater level loggers are installed in Hargeisa, Borama, Berbera and Burco in Somaliland; and Garoowe, Boosaaso, Gaalkacyo and Qardho in Puntland. Data from this network will help to prevent future depletion of aquifers due to the high risk of groundwater over-exploitation in major towns caused by the rapidly increasing demands for water for domestic use and watering livestock. No systematic groundwater quality monitoring is done. Local water utilities sporadically control water quality in their areas. Parts of the Jurassic limestone and alluvial aquifers in the south, in Juba and Shabelle catchments, are shared with Ethiopia. The Pliocene Merti aquifer is shared with Kenya. It comprises semi-cemented to cemented sands, intercalated clays, and intercalated limestone beds. Its effective thickness is estimated at 130 to 280 m. Groundwater in this aquifer is a non-renewable groundwater resource which is currently being used unsustainably, and a long-term plan for its use needs to be developed and jointly agreed upon by the two countries. There is no formal transboundary management strategy in place between Somalia and Kenya. However, the EU is supporting IGAD member states to come up with transboudnary management strategy including groundwater with focus on improving policy and legal frameworks in water resources management improved. FAO-SWALIM (Balint Z, Stevanovic Z, Gadain H et al.). 2012. 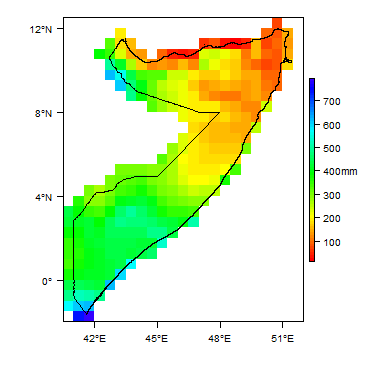 Hydrogeological Survey and Assessment of Selected Areas in Somaliland and Puntland. Technical Report No. W-20, FAO-SWALIM (GCP/SOM/049/EC) Project, Nairobi, Kenya. Humphreys H & Sons. 1960. Hargeysa water supply investigation. Westminster and Nairobi. United Nations. 1989. Groundwater in Eastern, Central and Southern Africa: Somalia. United Nations Department of Technical Cooperation for Development. Natural Resources/Water Series No. 19, ST/TCD/6. This page was last modified on 6 March 2019, at 10:40.